cascade, originally uploaded by jahansell. 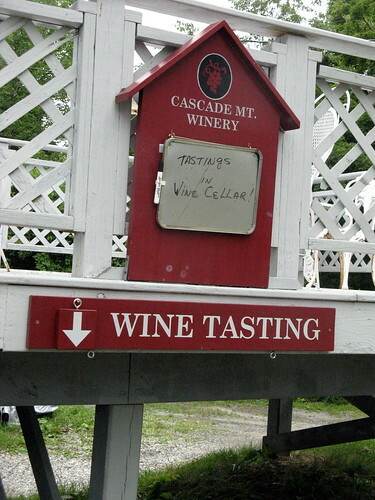 Here's a lovely spot to visit - the Cascade Mountain WInery in Amenia. They no longer grow their own grapes, but they still bottle wine there, and have a tasting bar and restaurant, in a sweet an pretty spot tucked away in the hills. I love Cascade, too. I've known the Wetmores since the 70s, when Charlie and I went to boarding school together in the Boston area. I didn't know that grapes are no longer grown on the property. Too bad. The wines have improved tremendously over the years, I think the best red is Private Reserve and best white is Seyval Blanc. The latter is semi-dry and quite fruity. A real treat.